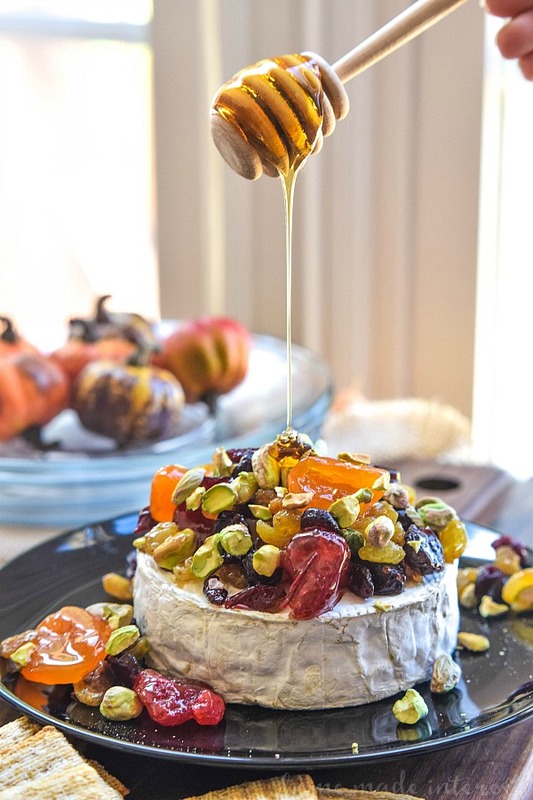 Dried Fruit and Pistachio Baked Brie - Home. Made. Interest. 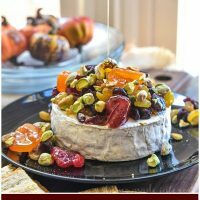 This Dried Fruit and Pistachio Baked Brie is an elegant and delicious appetizer recipe that is perfect for Thanksgiving, Christmas, and New Year’s Eve holiday parties. 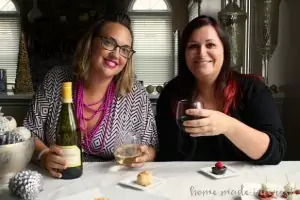 ‘Tis the season for holiday parties and that means delicious, decadent holiday recipes. I can’t wait! 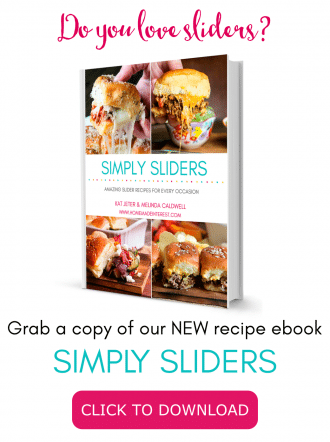 You know by now that when it comes to entertaining we always have a few recipes up our sleeve that are beautiful, easy, and are sure to please a crowd. 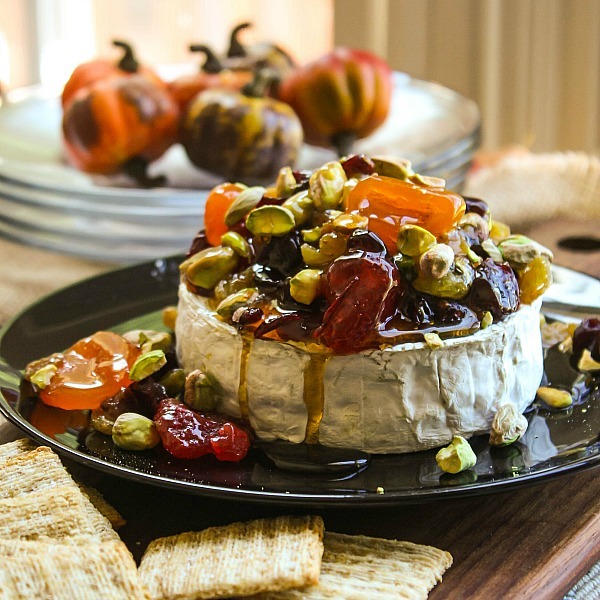 This Dried Fruit and Pistachio Baked Brie is always at the top of my list. It is a stunning appetizer that everyone will “Ooo” and “Ahh” over and it only takes about 20 minutes to make. This post is sponsored by Back to Nature in conjunction with Blog Meets Brand and I have been compensated for my participation. All opinions are my own. If you have never had brie the cool thing about it, other than tasting amazing, is that it has a soft white rind around it that can be eaten. 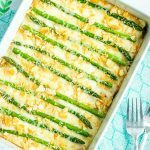 For this simple recipe you just place the wheel of brie on a baking dish and bake it at 350F for 15 minutes. The inside turns gooey and then you top it with dried fruit and crunchy, slightly sweet pistachios all drizzled with golden honey. 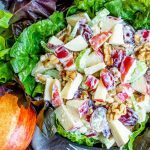 It’s a beautiful dish, and when you cut it open that soft, melted cheese and sweet, tart, crunchy mix of toppings, are perfect for scooping up on a cracker. 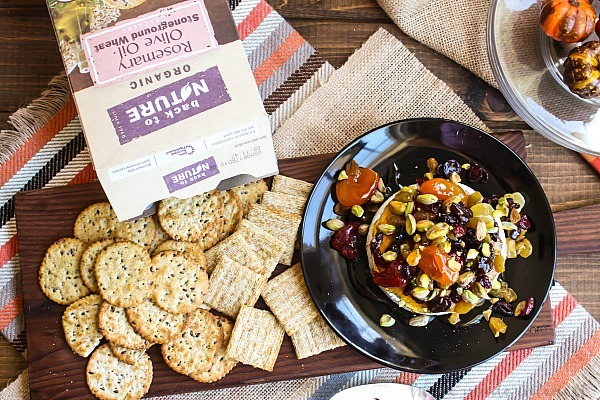 All of that cheesy, fruity goodness requires the right cracker and I’ve totally been digging Back to Nature brand crackers. they come in a ton of varieties so there is something for everyone. I’m loving the Rosemary Olive Oil Stoneground Wheat crackers and my guy it totally in to the Harvest Whole Wheat crackers. Back to Nature makes more than just crackers. They have a wide range of products including cookies, crackers, nuts and trail mixes, granola, juices, soups, and cereals that are delicious and affordable. Back to Nature understands that you want to know how your food is sourced so they have committed to transparent ingredient sourcing and in January 2015 Back to Nature began the process of obtaining Non-GMO Product Verification. Now more than 70 of their products are verified Non-GMO and they are working towards obtaining Non-GMO Product Verification for all of their products by the end of 2016! 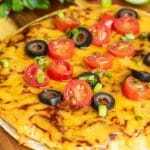 They also have several gluten-free options for those of you, like me, who have friends and family who need simple and delicious gluten-free options. 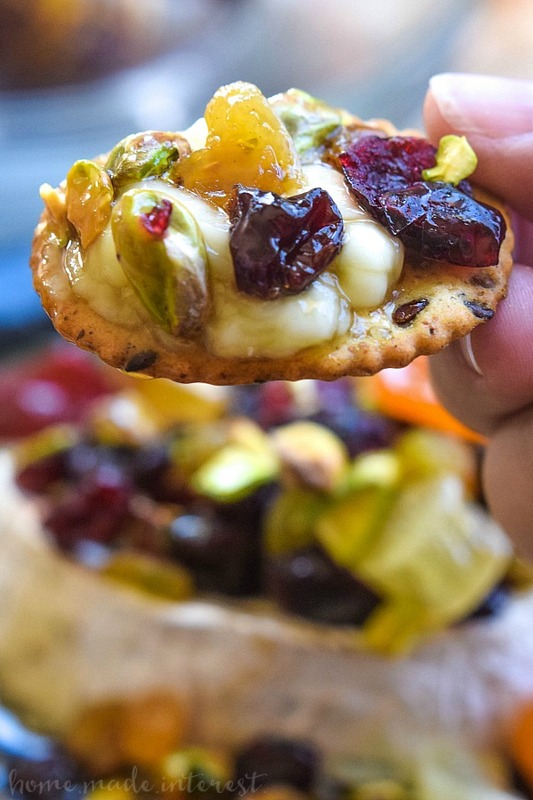 The dried fruit and pistachios are coated in a sweet drizzle of honey and placed on top of the melted brie to be served with bread and crackers. Place brie on a baking sheet lined with a piece of parchment paper (just in case it leaks). When the oven reaches 350°F place brie in the oven and bake for 15 minutes. Combine dried fruit, pistachios, and honey in a small bowl. Remove from oven, top with the fruit, nuts, and honey, and serve with crackers. Oh boy ! This is a great idea ! And the photos are absolutely fantastic ! Thank you. Will be back ! It should be an 8oz wheel of Brie. You can use a larger one if you are serving more people. The cook time might be a minute or two longer but that would be the only difference. 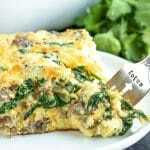 AMazing appetizer to offer when you have guest over! One of my favorite easy apps to make for the holidays!